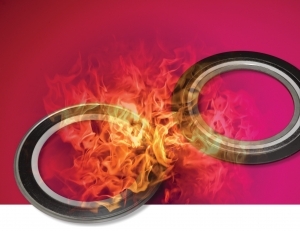 In response to growing industry demand and increasingly strict safety legislation, James Walker is launching two new multi-purpose gaskets certified as Fire Safe to ANSI/API Standard 607 and ISO 10497-5:2004 for critical CPI/HPI applications. Metaflex SG/IR Fire Safe is a spiral-wound gasket constructed from a 316L stainless steel inner support ring, winding strip with PTFE inner seal, graphite outer seal material and carbon steel outer ring material on standard design. The second product is a corrugated gasket variant, the CorruSafe FS, composed of a 316L stainless steel corrugated ring with PTFE inner envelope and graphite outer seal material. Both products are available in sizes from 1/2-in to 48-in in accordance with all relevant gasket standards and flange designations. Both capable of tolerating continuous operating temperatures of up to 260°C, the Metaflex SG/IR Fire Safe a maximum pressure of 350bar, CorruSafe FS 50bar. The Metaflex SG/IR Fire-Safe and CorruSafe FS products completed the independent fire type-test recording zero leakage under all conditions against a permissible figure of 17ml during the fire and 500ml post-burn. 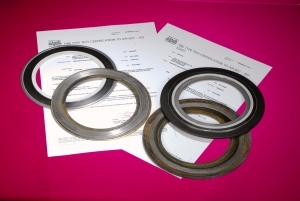 Metallic and semi-metallic gaskets are a key strength within the James Walker sealing product range, which also includes graphite, PTFE and non-metallic gaskets for all sealing applications and industry sectors, particularly those with extreme mechanical and thermal performance demands. The company also provides a 24hr emergency breakdown service specifically to cater for the operational environments and needs of oil, gas, petroleum and chemical processing industries.